You could say that makes us a food shopper’s paradise—but we’re more than that. Red Tomato Market is a dream come true for owners Steve and Miriam Swartzentruber. After more than 20 years in Mount Eaton as proprietors of Green Acres Furniture, Steve and Miriam did something they’d talked about for a long time—they opened a community market with their friends and neighbors in mind. That’s why, in addition to everyday grocery items, we feature a wide selection of fresh, organic produce—much of it locally grown. Of course, that’s not all. 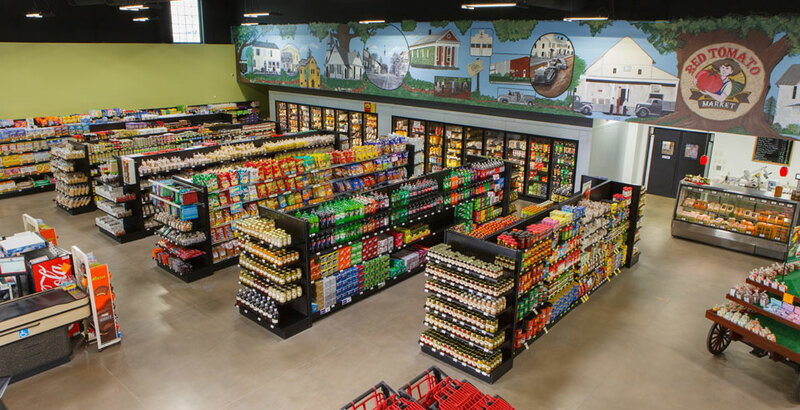 When you shop at Red Tomato Market, you’ll find a generous supply of bulk food items, a tantalizing section of baked goods, and a dazzling array of spices and gluten-free products. You’ll also love our deli, with its mouth-watering array of meats and cheeses. We also feature a soup and sandwich shop, serving breakfast, lunch and dinner for dine-in or takeout. At Red Tomato Market, there’s truly something for everyone. Just as important as the selection of products is the shopping experience, and Red Tomato Market is designed for your convenience and enjoyment. Come in and revel in our open environment and wide, brightly lit aisles. Everything about our store says, “Welcome, friends” – and we mean it! While you’re visiting, don’t miss our Mount Eaton mural—not that you could! It overlooks the entire store, and lets you take a step back in time and reminisce along with us about the rich and storied history of our wonderful community. It’s been said that a great local market will feature three things: wide selection, wide aisles, and wide smiles. At Red Tomato Market, we promise you’ll enjoy all three.